As a historian I spend a lot of time looking into the background of my ancestors and other family members but, as has already become apparent during the first couple of weeks of this project, hardly anytime on myself. 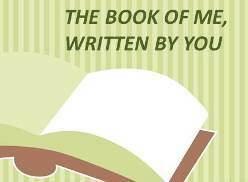 This week's prompt for the Book of Me is 'Describe your physical self'. I have written a longer private piece but the following are the edited highlights that I am happy to share with the world! You can easily access my other Book of Me posts by using the link in the Labels sorter in the left hand margin of my posts. I thought it would be an interesting idea, especially as we were spending the weekend with family and friends, to see what impression I'd actually made on people the first time they met me. However my plan for asking the other people at the birthday party we were attending what it was about my physical appearance struck them when we first met was mostly a failure. Everyone mentioned character aspects instead of physical ones, matronly or motherly, bubbly, organised, and so on. It was all very complementary but not very useful for this blog post. Even with a starter for ten of 'short' they couldn't get much further ... one person said cuddly and another commented on my long hair (in her experience all grownup women had short hair). The OH was a bit more helpful and remembered a bit from our first proper meeting: "You were short, not old, with big glasses and bushy hair. You were busy and stressed, and although you told me off you weren't nasty to me". I'd reprimanded him for taking a session off from volunteering at a Sheffield Beer Festival because he had been called to go and do an unexpected presentation on behalf of CAMRA in Barnsley. This was about fifteen or sixteen years ago now so I really shouldn't be surprised he can't remember any more details. My own thoughts: I'm small, but loud! I suppose I should be described as middle aged but I still feel 17 years old inside. Looking at myself in a mirror as Julie suggests is always a mixture of relief it's not worse and resignation at the new signs of age. My hair is greying in a distinguished - I think - wing like formation on the left hand side of my head, but not so much on the right - does that say something about the varying activity of the hemispheres of my brain? It is quite long, but usually I wear it twisted up and fastened with a silver coloured hair slide. As I mentioned in the last Book of Me post my eye colour is variable - green, blue or grey - it seems to depend on the weather or how I feel. I don't like wearing short or even knee-length skirts, I'm happier in trousers/jeans in which I take a size 14. I do have some long skirts, but mostly only wear them indoors. My top half is quite large (for which my daughter has never forgiven me) and thus I take size 18-20 in shirts, although since I lost some weight this year I can fit comfortably in a size L t-shirt again. I wear glasses, small squashed dark brown oval metal framed ones these days, the ones the OH remembers were 1990s huge plastic framed ones. I like to wear black, I have drawer full of black jeans and a wardrobe half full of black polo shirts, mostly beer related ones that I have been given for working at various beer festivals. When I'm at the Archives or the Local History Group meetings I wear a 'proper' shirt - but due to my large 'attributes' I tend to buy men's shirts in Primark or Marks and Spencer's ladies shirts I've picked up in charity shops. I don't do flowers or pink! I wear boots - I have wobbly ankles and went though a stage of falling down and breaking them a lot before I worked out that shoes and sandals aren't for me. This is another reason I don't do skirts. Even when I got married I wore a pair of slightly heeled lace up boots under my dress. I have a tattoo on my left arm, the armlet sized kind, high up so even a short sleeved shirt or t-shirt covers it and makes me look respectable. My mother said it looked Maori (just before she told me my arm was going to drop off as a consequence of having it done), but I think it's Celtic(ish). I usually wear dangly silver earrings, with purple stones or just plain silver Celtic knots. I don't like gold - even our wedding rings are white gold so they don't look gold. I wear mine on the third finger of my left hand (as is traditional) along with an eternity ring (more purple stones) the OH bought me to mark our anniversary. I would normally wear an analogue watch, large men's style, with a black strap, but the strap broke before GBBF (Great British Beer Festival) so it's been travelling around in my pocket for the last three months. I have a scar on my right eyebrow, outer end. It's from falling off a bicycle whilst on a Sunday ride out with the Cycling Club in the late 1970s. My complexion is ruddy - that's a polite word for saying I'm a bit red faced. I have a lot of broken capillaries and I don't wear make up - ever. My favourite hat is a maroon walker's hat bought in Scotland a few years ago - I call it my Downton Abbey hat - I usually wear it when it rains as it's much easier than juggling a brolly and a bag and so on when getting on and off buses and in the local shops. That's it in my profile picture at the top right of my blog. Love your hat, and wish I were brave enough to get a tattoo.